5pb. and Mages' horror adventure game arrives late July. 5pb. and Mages have dated Corpse Party: Blood Drive for a July 24 release on PS Vita in Japan. And it’s shared new details and screenshots, too. 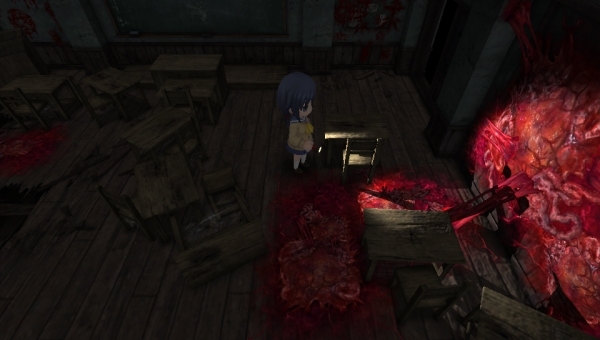 The game takes place two months after the events of Corpse Party: Book of Shadows. Having fallen severely ill by way of black magic she incurred, Ayumi is rescued by her family with the help of Naomi before things turn deadly. While she’s in the hospital, her older sister Hinoe and a woman who’s part of a spiritualist group pay her a visit, with the former telling her to hand over the Book of Shadows. Eventually, Ayumi manages to get out of the hospital and enrolls in Kisaragi Academy, where she learns about the deaths of Mayu and Yui. A mysterious hooded boy appears before her, telling her that if she retrieves the Book of Shadows again and uses it at Heavenly Host Elementary, she can bring her deceased friends back to life. Hearing that, she swears to get the book back into her hands and heads off to pay a visit to Makina Shinozaki, a blood relative of hers. Kuon Niwa (CV: Saori Hayami) – She’s the assistance teacher for Ayumi’s homeroom. She apparently arrived at Kisaragi Academy half a year before Yui died and Ayumi and company made their escape from Heavenly Host. Although she’s a soft-spoken teacher who treates her students well, she also has aspects of herself that are clouded in mystery. Misuto Kirya (CV: Jun Ohsuka) – Misuto is the boy who appears to Ayumi and tells her to get back the Book of Shadows to revive her friends. Magari Midzuki (CV: Maaya Uchida) – Magari is a young girl who transferred to Paulownia Academy. She’s a member of The Tomb of Maltuva, a secret society intent on tracking down the Book of Shadows. A combative type around other people in general, she conceals a cat while attending school and carries a large scythe on her person at all times. In addition to adventure parts, players will be able to take control of their character during exploration parts similar to Corpse Party: Blood Covered on PSP. Players will investigate each stage to their own ability, not knowing what is lurking, and where fear could strike at any moment. The Dummy Head Mic from previous entries makes its return in this game, as well. This allows the listener, using headphones, to perceive sounds as coming in from different directions. I’d imagine this is especially useful in a horror game like Corpse Party, where it could sound like someone is coming in from behind you. The game’s opening will be performed by Ayumi Shinozaki and Satsuki Mizuhara voice actresses Asami Imai and Yumi Hara. Pre-order bonuses include a special booklet.